We have done a few trips across to the Gulf Island this week (weather permitting) and it seems fishing has been slowing down just a bit. There are still fish there but fewer boats are coming back with some in the box. Thrasher Rock has been the main place to fish but I heard a report of a 24lb’r taken around the Grande area. The weapon of choice a has been hoochies particularly the Spackle back but bait and spoons have also worked. The 4″ Herring Aid has been popular but a 5″ kitchen Sink has been my favorite. The most consistent depths have been between 200′ to 220′ but a fishing buddy (Brian aka Bruiser) also reported hooking fish offshore at 165″ in the 800′ depths. As well as chinook, there are also a number of coho around too. One thing I found surprising was hooking them very deep. I had one hit the gear at 230′ down! Kiss and release! This was our first sockeye of the year. If you catch one like this it needs to be released. Moving over to our neck of the woods. Early in the week we started finding chinook and lots of coho on the east side of Bowen Island from Cowan’s Point to Roger Curtis. Last Sunday I trolled with the tide from those two points and hit fish all the way down. 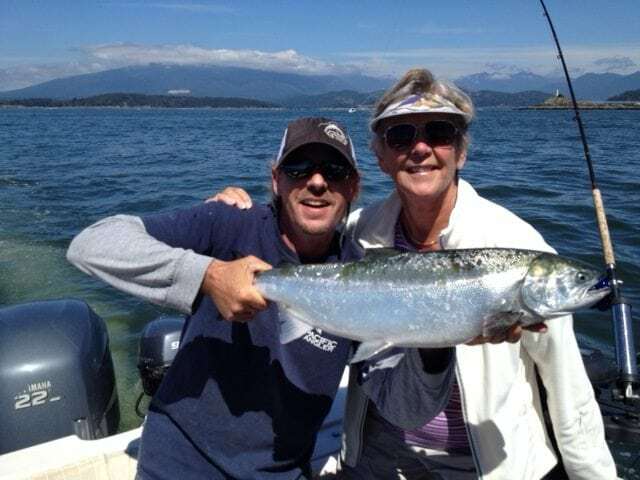 I got into a good concentration of coho at Roger Curtis and after securing dinner, my guest Pam fought and released a very big wild coho to finish off the day on her 75th birthday! Bait with UV clear, Clear Green teaser heads as well as 3.5″ and 4″ Irish Cream spoons with Chartreuse , Green Onion and Salty Dawg Flashers worked great. There was also a report from another angler that had a very good day with a “Big Ugly” hoochie and Purple Onion Flasher. Birthday girl Pam with a shot of her big wild coho just prior to releasing it. Again note the adipose fin. Fish like this need to be released. 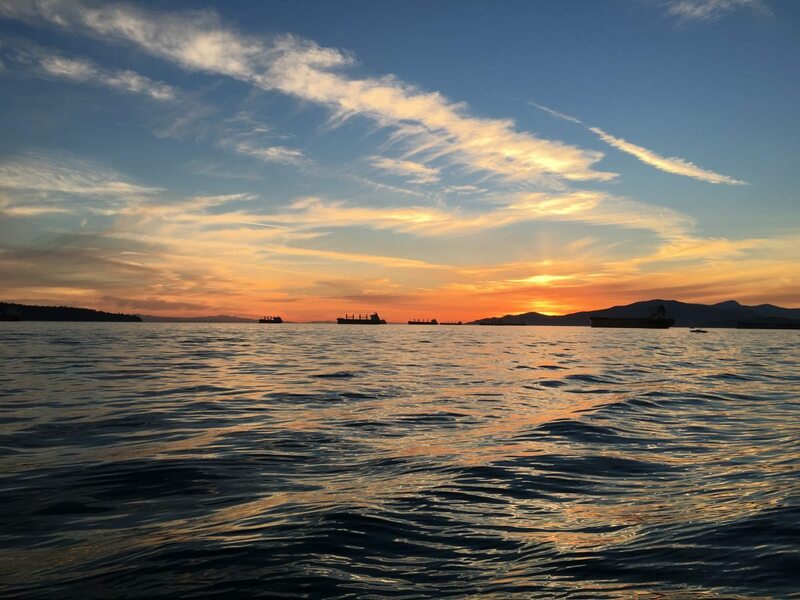 Moving over to the West Vancouver fishery things are really looking up. Finally with the lack of rain the numbers of fish are stacking up as predicted. Now there’s been some slow days but we’re progressively getting better days in which multiple fish are being caught. There’s also some nice big fish around with rumors of a 30Lb chinook taken earlier this week. Yesterday all of our boats got into a mix of coho, chinook and even the odd sockeye which must be released. One of our guests got lucky and had a great battle with a hard fighting 24lb Fraser chinook. The hot lures have been 3.5″ Herring Aid, Irish Cream and Cop Car Spoons. Hot hoochies have been White, Army Truck, and Strawberry Shortcake hoochies. Bait is also an excellent choice with Blood and bones, Glo white, Clear UV, Purple Haze, Clear Green, Chartreuse and Spackle back teaser heads. I’ve seen a variety of different flashers up as boats are fighting fish so experiment with different ones to find your favorites. The fish are primarily eating anchovies which is what we’re finding when we clean them. 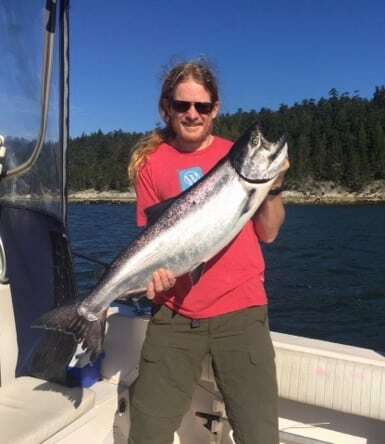 Andy landed this really nice Fraser chinook yesterday! As the weather continues to be good the fishing is expected to get even better! Have you registered yet? For only $300 per registered angler you can spend the weekend on the water and land the winning fish! 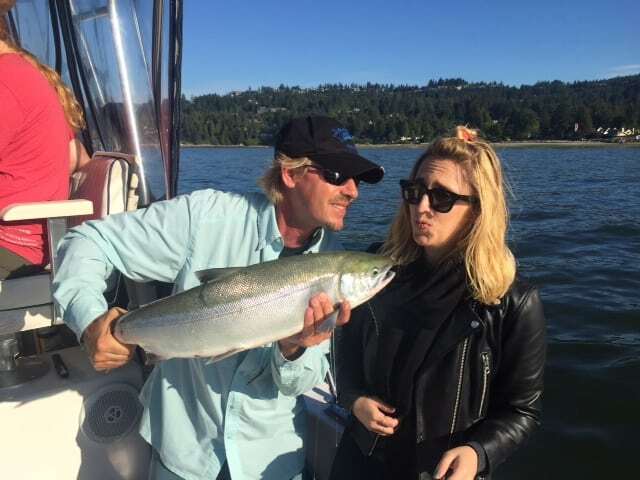 Aside the chance at $15,000 for reeling in the winning fish registration includes a hot fisherman’s breakfast each morning, moorage at Pier 73 Marina and Yacht Club, Saturday evening dinner and an afternoon BBQ awards ceremony on Sunday. All that plus some amazing prizes! Effective dates: 00:01 hours, Monday, August 1 until 23:59 hours Saturday, December 31, 2016. Waters: Subareas 29-6, 29-7, 29-9 and 29-10 (Fraser River mouth). Management measure: the daily limit for chinook salmon is two (2) with a minimum size of 62 cm. There is no retention of sockeye salmon permitted at this time. Given the low abundance of sockeye, the Department is working with all fishers to limit impacts. Selective fishing techniques are to be used to minimize impacts on sockeye. The Department will continue to review stock status and environmental information on a regular basis and should environmental conditions change or concerns on impacts due to fishing activity occur, this fishery may be closed on short notice. Updated information will be announced by fishery notice. Variation Orders Numbers: 2016-301, 2016-328 and 2016-334. Notes: Barbless hooks are required when fishing for salmon in tidal waters of British Columbia. The term “marked” means a hatchery fish that has a healed scar in place of the adipose fin. Sport anglers are encouraged to participate in the Salmon Sport Head Recovery program by labelling and submitting heads from adipose fin-clipped chinook and coho salmon. Recovery of coded-wire tags provides critical information for coast-wide stock assessment. Contact the Salmon Sport Head Recovery Program toll free at (866) 483-9994 for further information. Anglers are advised to check: http://www.pac.dfo-mpo.gc.ca/fm-gp/rec/index-eng.html for fishing closures and other recreational fishing information.